Susan Jenkins Meers meets Bleddyn Môn of Anglesey, Wales. Volvo Ocean Race 2017 - 2018 Stop Over Thursday, May 17 was somewhat overcast but it didn’t hinder Susan Davies Sit and me from venturing to Newport, RI, at the invitation of the Welsh Government for the cocktail party kick-off of the Newport, RI to Cardiff, Wales, leg of the Volvo Ocean Race. We arrived at the lovely venue of the Chanler, perched along the famous cliff walk and took a breath-taking look out over Narragansett Bay and the wide Atlantic. Not unmindful, I might add, that our beloved Wales was just across the water; 6-8 days across for the crew of the “clean seas” yacht. As we entered the marble and gilt lobby we were directed to the veranda.On the cool May evening, the atmosphere was warm, friendly and gracious.We were met by Efe Sokol and Kelly Taylor of the Welsh Government Office based in New York City, and Steven Nase of Visit Wales, also in NYC. 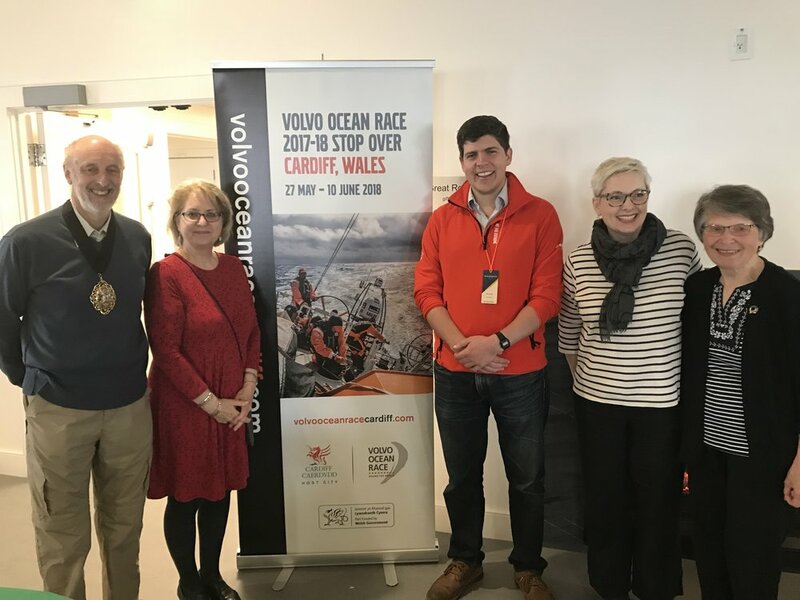 Also present for the celebration was Bleddyn Môn, a resident of Anglesey, Wales, and a crew member of “clean seas - turn the tide on plastic” yacht who spoke about conditions onboard the yacht and his responsibilities while at sea. I was very anxious to meet Bleddyn because my ancestors sailed the seas from Borth, Wales, which is just down the coast from the Llyn Peninsla. He is a delightful young man who told us the story of his parents moving to Anglesey, she a Davies and he a Griffith, and deciding to give the last name of Môn, meaning Isle of Anglesey to their offspring. Photo shows Susan Jenkins Meers meeting Bleddyn Môn. Enjoying the party were members of the RI Welsh Society: Jane Morgan and her husband Craig of Richmond, RI.It was mutually agreed that WSWNE and the RIWS should make a concerted effort to join together in an activity soon.The hors d’oeuvres, cheese table, wines, etc. were splendid, venue perfect and this Walesophile was incredulous at the invitation and experience. 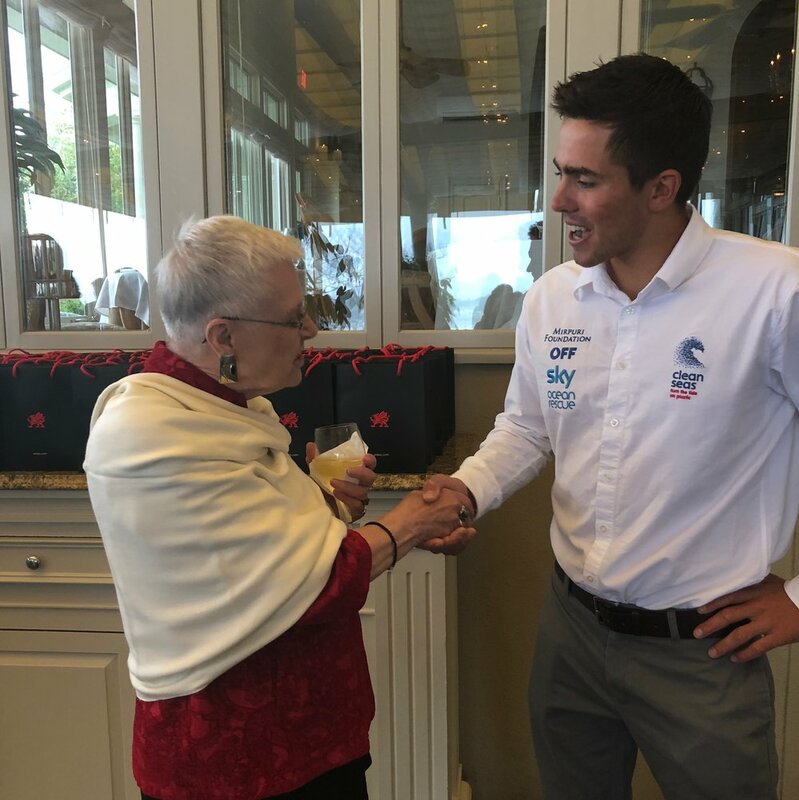 Following on from this event, we attended a Media Breakfast on Sunday morning at Sail Newport on Fort Adams Drive also hosted by the Welsh Government, close to where the Volvo Ocean Race boats were being readiedfor the next leg from Newport, RI to Cardiff, Wales. The breakfast was attended by three members of WSWNE, plus RI Welsh Society members, various media personneland travel writers as well as the Cardiff Mayor and Huw Thomas, Leader of the Cardiff Council, and members of a PR firm who will be video taping the celebration and events that will greet the boats when they arrive in Cardiff. We made contacts with many people, who in turn are interested in the work we do as a Welsh Society, and offering to be in touch about our future events. Photo shows: Bob Derbyshire, Lord Mayor of the City of Cardiff, Susan Davies Sit, President WSWNE, Huw Thomas, Leader of Cardiff Council, RI Welsh Society member Tracy Vaspol and WSWNE member Beth Roberts Brown at the Media Breakfast. Diolch yn fawr for two unforgettable events celebrating Wales.